Are you trying to decide between either 360 Frontal Wigs vs Full Lace Wigs for your next lace wig purchase ? Both 360 Frontal Wigs and Full Lace Wigs are two widely consumed lace wigs in the hair market. In this article, we will compare and contrast the pros and cons of both the 360 Frontal Wigs verses Full Lace Wigs and explain their benefits and some disadvantages , so you can make a better choice of lace wig purchase that will better suit your styling requirements. Before going into detail, let’s take a quick look at both popular lace wigs and what makes them stand out. What is a 360 Frontal Wig? 360 Frontal Wigs or 360 Wigs ( as it’s better known) is one of the latest go-to option for bundles and lace frontal closures wearers . It gained great consumer demand since it’s 2016 launch to the hair market. As discussed previously, these 360 wigs are made by adding wefts in the middle from a standard 22×4.5×2” measured 360 Band Lace Frontal hair piece , which gives the wig wearer optional styling without exposing the wefts from the original sized 13×4”- 13×6” Lace Frontal closures in the past. With the advancement of the 360 Frontal Wigs you can achieve several uniquely styled up-do hairstyles without the over exposure of your bundles, as well it saves time on sewing the bundle hair extensions with the likes of previously consumed lace closure pieces. With the 360 wigs the wefts are already sewn in, this helps those who are not versed with proper preparing of a typical sewn in procedure from scalp care or prepping , braiding of the natural hair , weaving net application, threading several needles, followed by a few long hours of sewing wefts on braided hair and final styling. These 360 lace wigs has changed the game and time frame of achieving the optimal style a woman desires in less consuming time frame. What is Full Lace Wig ? A Full Lace Wig are designed lace wig cap which are made by hand-tying and double knotting hairs in a full cranial soft Swiss Lace material with a stretch panel in the middle for ease of wear and restyling for high ponytail hairstyles. Each of our full lace wigs comes with baby hairs along the entire unit. Full lace wigs are available in Remy Human Hair as well Virgin Human Hair, they can be styled in most of today’s trendy hairstyles , and can be utilized as a means to cover hair loss, short hairs or simply for fashion reasons. However, they both have different pros and cons which make them unique. Let’s dig deeper. What to Look for before you purchase your next Lace Wig ? 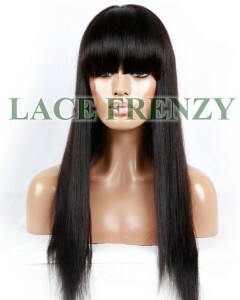 If you are just starting out, then you would want to keep a few things in mind when choosing either of these lace wigs . There are a few basic factors that are crucial when deciding which lace wig cap design option will be better suit your restyling needs your next lace wig purchase . • Budget – Cost of each lace wig can range from low to high, based on hair type ( hair origin), density (thickness of the hairs) hair length and wig cap style . • Ease of Use – How easy will be to wear for beginners to veteran wig wearers. • Protective Hair-styling – It should support the option to gain protective hairstyle option. • Ease in Styling– Your Lace wig should not only be comfortable to wear but also easy to re-style, being stuck with one hairdo overtime will become boring. Being able to freely restyle your lace wigs are the best option by giving the wig wearers a fresh hairstyle option every other day. These are just some of the basic things you need to look at. Depending on your lace wig cap choice , you may also want to consider how these lace wigs styling capabilities are like: ease of wear , natural looking, hair-styling ease, and more. In this 360 Frontal Wigs verses Full Lace Wigs comparison, we will review how both lace wigs compare on these basic requirements. Newcomers to lace wigs who are not well versed on the pros and cons of lace wigs. Consumers traditionally gain their learning curve through either hairstylist or through video tutorials and word of mouth from friends yet still end up with a not so good “first-time” installing their lace wigs. Even experienced wig wearers may experience the same outcome. Most forget when choosing whether to use wig adhesives or wig tapes they may have to go through several kinds of adhesives , until they find a great wig glue or wig tape , that works best with their body’s chemistry over time without slippage of the wig after adhering or the mishaps of applying glues to hairlines – which, if left unattended will lead to tearing of one natural hairs and the delicate Swiss Lace material of the wig when in a panic. Let’s take a look at 360 Frontal Wigs and Full Lace Wigs to see which one has more ease of use. 360 Wigs are a great wig option for both newbies to the well experienced wig wearers alike. Due to several factors, 360 Wigs packs in multiple ease of wear features that’s effortless right out of the bag. It comes with an advanced ease of wear that can be a good compliment for any wig wearer. It is easy to install and most of you will get a snug fit accompanied by the anatomic curve constructed wig cap design and four(4) combs intricately sewn in so most won’t have the required need to use wig glues , natural hairlines , the capabilities to place in a very high bun hairstyle. As an added bonus the lower (nape area of the wig) features adjustable straps-which is the key benefit to giving any lady a comfortable and secure feel when wearing the 360 wig. Whether it’s the several purchase options of interior wig cap designs featuring either 5×4” silk base wig cap design -which gives a realistic scalp illusion or the Thin Skin Perimeter Wig Cap ( ideally for individuals with circumferential hair thinning or loss), to the all lace (Full Lace Wig) interior wig craftsmanship. 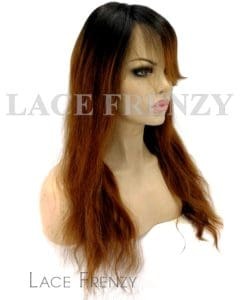 These full lace wigs have more freestyle parting options in comparison to a 360 frontal wig, due to these wig cap design and restyling options . All beautifully handmade with natural hair lines and baby hairs going around the entire unit for a more authentically flawless appearance. 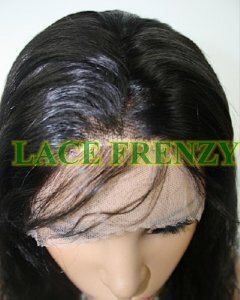 However the full lace wig will require circumferential adhesion with the best chemistry fit wig glue. 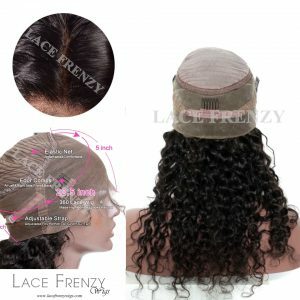 One can always inquire prior to purchase : if adjustable straps and combs can be placed on the interior of the full lace wig cap for better ease in application. – Lifespan of 12 months or more depending on individual wig care. – Learning curve: Learning would be the first step, you’ll have to understand the proper braiding patterns required for not only comfort but ease of style,to wear and remove the wig. This wouldn’t be a very difficult thing to do; you will get it after repeating the process for a couple of times. – Wig Adhesives: There several types of adhesives available in the market, but only few will work great with your chemistry so there will be trial and error period until finding “the one”. – Maintenance : Just like your natural hair these human hair wigs require care . From washing and deep conditioning. This has to be done every 2 to 4 weeks. More frequent during warmer weathers. – Clean-up: Clean up is required before and after reapplying. Just like the 360 frontal wigs these full lace wigs face similar if not exactly the same drawbacks. • Learning curve: Learning proper trimming of the lace material techniques. Placing the wig at the right points without damaging one’s hairline, are some of the learning curves you will face at first attempt in attachment of your lace wig. • Wig Adhesives can be tricky: With several in the market, once again trial and error , plus finding the one to work greatly with your body’s chemistry. Will give the ultimate results. • Wig Reapplication: Should be done every 3 to 4 weeks. • Clean-up: Clean up is required before and after reapplying, which may be time consuming. * Proper hair care products usages. Selecting the best hair styling products gives moisture and great luster to your full lace wigs. Many women are suffering from thinning hair, short lack luster hairs due to many factors from health , stress and other environmental causes. Therefore, lace wigs has become not only a savior but a confidence boaster in most instances in the everyday activities of lace wig wearing woman’s life. This entry was posted in 360 Band Lace Frontals, Custom Celebrity Lace Wigs, Full Lace Wigs, Glue less Full Lace Wigs, Hair, Human Hair Wigs, Lace Wigs, Silk Base 360 Frontals, Silk Top Full Lace Wigs, Virgin Hair Lace Wigs, Virgin Human Hair 360 Frontals with Bundles, Wig Knowledge and tagged 360 frontal wigs, 360 wigs, Brazilian Virgin Human Hair 360 Frontal Wigs, Full Lace Wigs, human hair lace wigs, Silk Top Full Lace Wigs, Virgin Grade Human Hair Full Lace Wigs, Virgin Human Hair 360 Frontal Wigs.